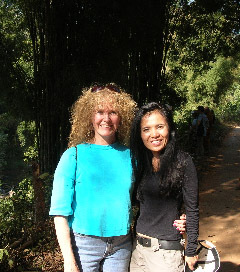 In January of 2007, Kristal ushered in the New Year in Thailand where she had traveled to meet and work with Lek Chailert at her elephant sanctuary, The Elephant Nature Park. She was part of a group, The Power of One, organized by Juelle and Donovan, whose vision it is to teach young kids that they have the power to make a difference in the world. It was an incredible experience to be with American and Thai young people as they learned about each other's cultures and values, all the while learning about elephants: their magnificence, beauty and, unfortunately, how much they suffer in a culture where they are domesticated. 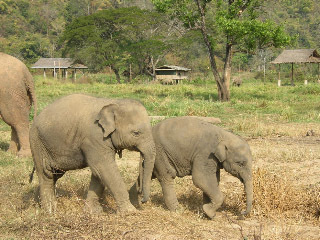 Lek and Kristal share together their deep love and commitment to elephants. 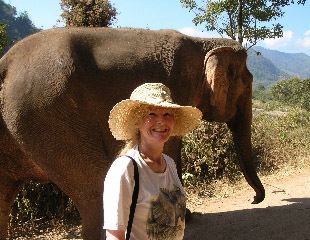 Feeding the eles bananas. They eat the whole bunch at once! 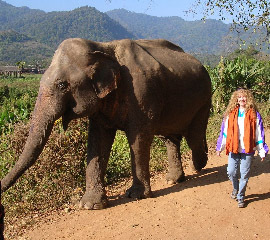 Morning stroll with an elephant! has grown up with elephants, knows them intimately and is totally committed to protecting them from the horrendous torture of the "pajaan", the Crushing Box. 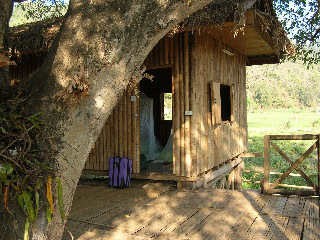 She is trying to teach the Thai mahouts (people who own elephants) that they can use love and kindness to train elephants. The Crushing Box is a centuries old breaking method used throughout Asia. It is so cruel and painful that 40% of the elephants die from it. Another 40% go crazy. Some will even commit suicide (by stepping on their trunk or jumping over a cliff). See the video below for a short clip of this method... If video does not start, click here to view.